Background: Accessibility to pharmacy, including geographic accessibility, is an important goal every government tries to meet. 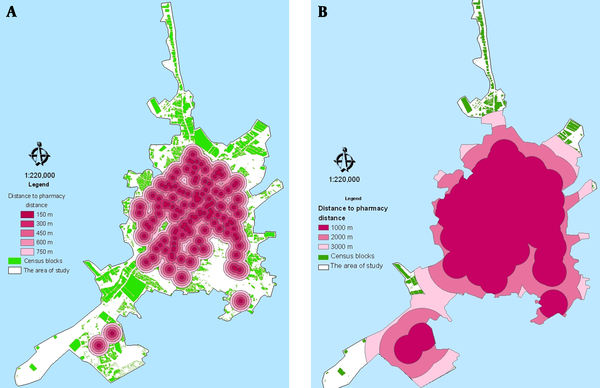 Objectives: In this study, we analyzed the geographic distribution and accessibility of pharmacies in the municipal territory of Qom (a province in Iran) for both pedestrians and drivers. Materials and Methods: The analysis was based on straight-line distance measurements. We considered 150, 300, 450, 600, and 750 m for pedestrians, and 1, 2, and 3 km for driving accessibility as the acceptable distances. We calculated the number and percentage of households located at the acceptable pedestrian and driving distances from each pharmacy. In the second part of study, the day-opened pharmacies were omitted to calculate the pedestrian and driving geographic accessibility of pharmacies during holidays, on weekends and at night. Results: Our analysis indicated that in normal days about 88% of the households located in Qom have acceptable pedestrian accessibility, and almost all of them have acceptable driving accessibility to a pharmacy. In terms of geographic accessibility to the 24/7 pharmacies, the results showed that less than 30% and 95% of households have acceptable pedestrian and driver accessibility, respectively. Conclusions: Geographic accessibility of pharmacies at night and on holidays has to be addressed by provincial health policymakers. Pharmacies are healthcare centers in which patients can access medicines and pharmaceutical services from a qualified pharmacist (1). Pharmacies play an important role, especially for poor people who may not be able to reach a physician for consultation. Equal accessibility to healthcare services, including medication and pharmaceutical services, is a fundamental goal that every territory is trying to achieve (2). Accessibility is a very broad concept, encompassing many aspects, including availability, acceptability (related to other issues such as ethnicity, culture, religion, etc. ), affordability, and geographic factors (3, 4). Among these aspects, geographic accessibility plays a basic role and many studies have been conducted to investigate the impact of proximity on health services utilization (5-7) and healthcare outcomes (8). The distribution of health services is also one of the social determinants of health (9). 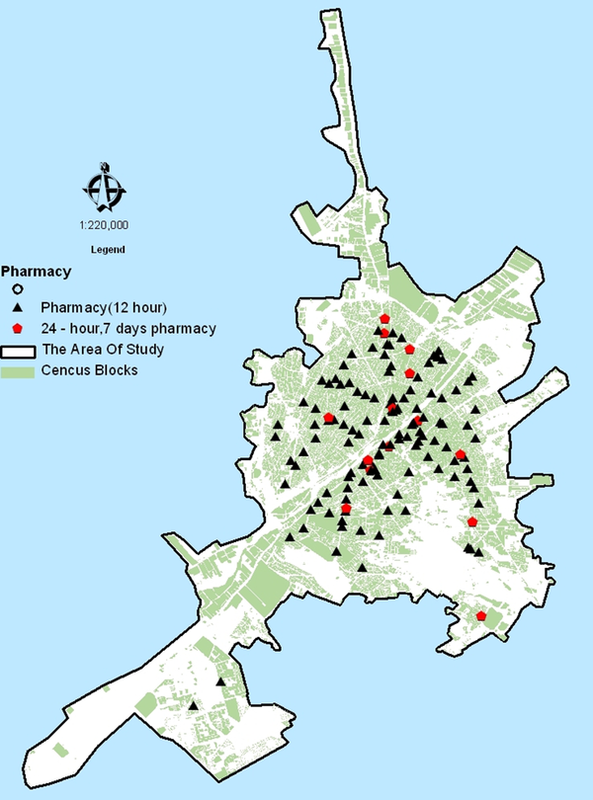 In Iran, many studies have measured the geographic accessibility to many public places (10, 11), but there have been no reports concerning the geographic accessibility of pharmacies. There are three types of pharmacies in Iran: day-opened pharmacies (open from 9 am to 9 pm and closed on holidays, weekends and at nights), 24-hour, 7-day (24/7) pharmacies (always open), and half-day pharmacies (open for only half of a day, either morning or evening); however, the third pharmacy type is negligible. The Iranian Ministry of Health requires that in the cities with more than one million inhabitants, the distance between two day-opened pharmacies must be at least 300 m, the distance between two 24/7 pharmacies should not be less than 1000 m, and the distance between a day-opened pharmacy and a 24/7 pharmacy has to be at least 240 m (12). This regulation is implemented to ensure the accessibility in different parts of a city rather than a concentrated pattern of pharmacy distribution. The purpose of this study is to assess the geographic accessibility of pharmacies, for both pedestrians and drivers, in the urban area of Qom. Qom is the capital of Qom province, which is located in southwest of Tehran (capital of Iran) and has a population about one million. For measuring geographic accessibility in urban Qom, we used geographic information system (GIS) capabilities (13). Arc GIS 9.3 software (Esri, Redlands, Canada) has been used for measuring geographic accessibility in the published studies around the world. The World Health Organization (WHO) has also acknowledged the potential role of GIS and using maps in the decision making process for health policies (14). The necessary data about pharmacy locations were requested from the Deputy of Food and Drug Affairs at the Qom University of Medical Sciences. The pharmacies were located on a map and verified by map experts. The hospital pharmacies which don't provide services to patients directly and half-day opened pharmacies (totally eight pharmacies) were excluded from our analysis. The population data at the block and parcel level was extracted from the Iranian population and housing census. Parcel is the smallest unit in maps and, in this study, each parcel was considered as a household regardless of whether somebody lives there or not. Road network data was unavailable for Qom; therefore, our analysis was based on straight-line distance measurements. For measuring pedestrian accessibility to pharmacies, we considered 150, 300, 450, 600, and 750 m to be acceptable distances, whereas for driving accessibility, we used 1, 2, and 3 km as acceptable distances, based on a previously published study in Canada (15). In the Ontario study, the maximum acceptable distance for driving accessibility was 5 km, which we changed to 3 km because of methodological differences (straight-line versus road network analysis). Afterwards, we calculated the number and percentage of households that were at acceptable pedestrian and driving distances from each pharmacy. In the second part of our study, the day-opened pharmacies were omitted to calculate the pedestrian and driving geographic accessibility of pharmacies during holidays, on weekends and at night. In 2011, there were 137 pharmacies in Qom, including 123 day-opened pharmacies and fourteen 24/7 pharmacies. Generally, there is a mean of 1.38 pharmacies and of 0.14 24/7 pharmacies per 10000 people living in Qom. The pharmacy distribution is shown in Figure 1. As shown on the map, most of the pharmacies are located in the central parts of the city. Figure 2a indicates the different areas covered by each pharmacy and the parts of the city that have appropriate pedestrian geographic accessibility. Although a considerable area of the city is outside the appropriate pedestrian accessibility area, about 88% of households have acceptable geographic pedestrian accessibility (maximum 750 m distance) to pharmacies in Qom on ordinary days, which shows that there are few residents in these areas with inappropriate geographic accessibility to a pharmacy on ordinary days. Also about 12% of households have at least one pharmacy within 150 m of distance (see Table 1). Driving geographic accessibility on normal days (Figure 2b), which we identified at three different distances (1, 2, and 3 km), was acceptable for 94% of households. At least one pharmacy was within 1 km range, and about 99% of households had at least one pharmacy within 2 km on normal days (see Table 1). a, pedestrian geographic accessibility; b, driving geographic accessibility. Our analysis showed that less than 30% of households had appropriate pedestrian accessibility to at least one 24/7 pharmacy in Qom (Table 2). Figure 3a shows the different acceptable pedestrian distances for each 24/7 pharmacies. With regards to driving geographic accessibility, our study indicated that about 47% of households in Qom have at least one pharmacy within 1 km range, and about 95% have a pharmacy within 3 km (Table 2). Figure 3b shows the different acceptable driving areas for each pharmacy. The geographic accessibility to pharmacies in Qom seems to be acceptable, but in term of accessibility at night, on holidays and on weekends, there is a gap in pedestrian access. This gap strongly affects the accessibility of pharmaceutical services during the year, because there are more than 70 holidays and weekends per year in Iran. Policy makers must also take into account that about 7% of people living in Qom are over 60 years old, and the geographic accessibility of healthcare providers is more important for these older individuals because they need more medical and pharmaceutical services (16). Moreover if we consider the limited driving ability in the elderly and the proportion of them with no personal vehicle and also some disabilities due to illness that cause difficulties for patients in using the public transportation system on holidays and weekends, the level of geographic accessibility would be worse and the necessity for much more appropriated policies would be better understood. There are two other studies evaluating geographic accessibility of pharmacies in Ontario (16) and Nova Scotia (17). From these studies, it was indicated that 63.6% and 40.3% of residents living in Ontario and Nova Scotia have walking accessibility to a pharmacy and 84.6% and 62.6% of them have acceptable driving accessibility (2 km) to pharmacy, respectively. It means that geographic accessibility in Qom could be considered as acceptable; however there are some methodological differences as well as differences of study settings. Measuring pharmacy accessibility is possible using several approaches, including straight-line distance on the map, network distance, travel time, perceived distance, etc. (18-20). In this study, we did not have access to road network data for Qom, so the straight-line distance was analyzed. Straight-line distance, because of not considering barriers, transportation routes, and traffic limitations, may not adequately represent the geographic accessibility at all times. In addition, in the assessment of pharmacies’ geographic accessibility, there were many confounding factors we were not able to control. For example, the effective factors regarding the selection of a pharmacy by patients may influence accessibility (21). People may prefer not to visit the closest pharmacy for many reasons, including quality, socioeconomic reasons, cost, and the severity of the illness (22, 23). For instance, some people prefer to go to a 24/7 pharmacy because of probable greater brand availability, and some customers prefer to visit a pharmacist at a day-opened pharmacy because there is more time for a consultation, and so on. Also, part of the population benefits from healthcare coverage through small insurance funds (there are many public and private health insurance companies in Iran, that cover only a small portion of the population) that are not under contract with all the pharmacies and other health care centers. Consequently, their customers have limited choices in the city and, therefore, geographic accessibility is influenced by this fact. In cities like Qom, some hospitals or healthcare centers, including charity pharmacies, Army Forces pharmacies, etc., provide free services and people, regardless of their distance, may prefer to receive free or discounted services at these centers. Cultural issues also affect geographic accessibility. For example, in some cultures in Iran, people prefer to fill their prescriptions at a pharmacy near the physician’s office. In some other cultures, people prefer to fill their prescription from a fixed pharmacy near their houses. In this study, we neglected these factors affecting customers’ behaviors, so they should be considered as limitations of the study. One other important consideration about this study is that we took each parcel as a household regardless of family size. This means that we did not include population density into our analysis, explaining the reason for which we report our results in terms of percentage of households, rather than percentage of population. 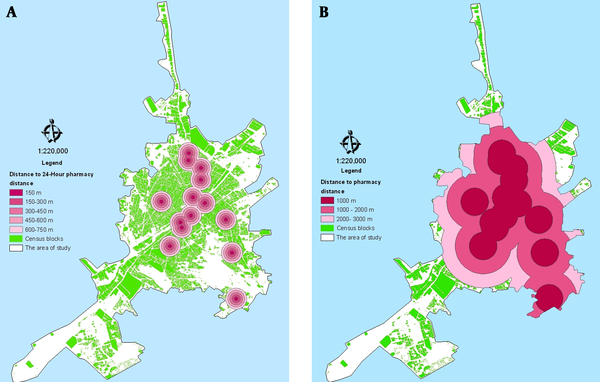 Population density of a district could be an important variable for establishing pharmacies and other healthcare centers. Another issue is the tool that policy makers can obtain to address the failures in the equitable distribution of healthcare centers. Policy makers in Iran, as we mentioned above, only intervene in the issue of pharmacy location by keeping the determined distances between different kinds of pharmacies. In spite of the appropriateness of the determined distances, this method cannot be enough to support the accessibility of households which are situated in deprived and low-population areas. Therefore, other strategies, like for example offering financial incentives for pharmacists to establish their pharmacy in low-access areas, seem essential to be applied for ensuring acceptable geographic accessibility to pharmacy. However, it is very difficult to accurately measure geographic accessibility due to the factors mentioned above, yet it would be useful for policymakers to acquire a general knowledge about the distribution of healthcare providers in the cities they govern. Then, these policymakers can allocate healthcare resources more efficiently and equitably. Provincial policymakers have to decide about the parts of city that don't have acceptable geographic accessibility to pharmacies, especially 24/7 pharmacies, in which the accessibility, especially for pedestrians, was poor. The lack of economic justification for pharmacy locations is the main reason for the absence of pharmacies in certain areas, but some solutions for holiday pharmacy access could involve keeping a pharmacy open in low access areas under the supervision of the provincial Deputy of Food and Drug, while also providing financial incentives for pharmacies in low access areas of city. The authors would like to express their gratitude to all experts in Qom provincial center (Department of Statistics & Information, Office of Map GIS) who participated in this study, and especially the general manager of the department, Mr Javad Shaaker Arani, for providing valuable data. Implication for health policy/practice/research/medical education: This study is of use for policy makers to improve their knowledge about the distribution of pharmacies as regional healthcare centers easily reachable for the population and to find solutions for the existing inequalities regarding their accessibility. Authors’ Contribution: Amir Hashemi Meshkini has contributed in the design of the study, analysis and writing manuscript. Khosro Keshavarz contributed to the design of the study, data search and literature review. Mohammad Reza Janghorban contributed in data collection and analysis. Abbas Kebriaeezadeh contributed in designing the study and also coordinated this work. Shekoufeh Nikfar contributed in designing the study and writing the manuscript. All authors have read and approved the final manuscript. Financial Disclosure: The authors have no conflicts of interest that are relevant to the content of this manuscript. Funding/Support: This study was not financially supported by any public or private organization.